About the Book Wendy Jean MacLean: ponders ducks and vegetables and delights in life´s small wonders. She likes to play with theories and tease the puns out of the (groaning) cosmos. This is her second book of poetry. The first, Rough Angel, translated by Michel Gadoury, was published by Borealis Press in 2006. Before studying Theology, Wendy taught elementary school in Chibougamau, Saudi Arabia and Ethiopia. 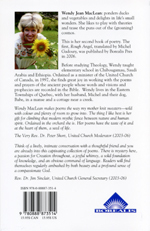 Ordained as a minister of the United Church of Canada, in 1997, she finds great joy in working with the poems and prayers of the ancient people whose words and visions and prophecies are recorded in the Bible. Wendy lives in the Eastern Townships of Quebec, with her husband, Michel, and their dog, Babe, in a manse and a cottage near a creek. Wendy MacLean makes poems the way my mother knit sweaters—wild with colour and plenty of room to grow into. The thing I like best is her gift for climbing that modern mythic fence between nature and human spirit. Ordained in the orchard she is. Her poems have the taste of it and at the heart of them, a seed of life. Think of a lively, intimate conversation with a thoughful friend and you are already into this captivating collection of poems. There is mystery here, a passion for Creation throughout, a joyful whimsy, a solid foundation of knowledge, and an obvious command of language. Readers will find themselves regularly ambushed by both beuaty and a profound sense of a compassionate God.